At least, that’s what it seems everyone is saying these days. So we’ve all heard somewhere that when the going gets tough in a workout or race, liquids beat solids hands down, right? Short and sweet summary: The solid bars did just as well as the liquids. At least for cyclists. 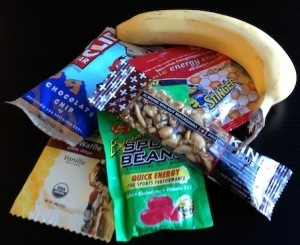 What about gels vs. drinks? This study demonstrates that a GLU+FRC mixture is oxidized to the same degree when administered as either semi-solid GEL or liquid DRINK, leading to similarly high peak oxidation rates and oxidation efficiencies. Short and sweet summary: the gels did just as well as the liquids too. At least for cyclists. …what about for more stomach-sloshing motions, like running? I dug in, but couldn’t find a study specifically on runners (leave your comment below if you happen to find one on runners). However, I did find one on triathletes. Scientists at University of Utrecht in the Netherlands compared liquid versus solid carbohydrate intake before and during prolonged exercise in 32 triathletes who were training for anything at or above the level of a sprint triathlon. Study participants took part in hard workouts that consisted of two bouts of cycling lasting 45-50 minutes at about 75% VO2max (85% of maximum heart rate) and two running workouts lasting 45 minutes, also at 75% VO2max. So first, the triathlete cycled, and then they ran. Then after a 6 minute rest, they completed a maximal cycling test consisting of three minutes of pedaling at 175 Watts and then three minutes of 100% all-out intensity. Oh, and these poor folks weren’t done yet. After four minutes of rest, the triathlete then cycled again, rested for six minutes, did a second maximal test on the bike, rested for four more minutes, then ran again, rested for six minutes, and then completed a final cycling test. If you were doing the math, that is over three hours of exercise with an average heart rate at or above 85% of maximum heart rate. As if that weren’t enough, each participant had to do this three times through at different times, each time with a different fueling scenario: once with caloric liquids only, once with a mix of liquids (white bread, marmalade and bananas – yummy), and once with a non-caloric liquid placebo that was basically just food coloring. Water intake was the same between all groups. So which treatment was best? Half of the triathletes in the study were able to complete all three hours of hard exercise when they took in liquids only, but just nine of the triathletes could handle the same workout once solids were added in. And even the ones who didn’t finish the workout weren’t able to go as hard for the part of the workout that they did actually complete. In other words, liquids beat solids hands down once running was introduced in a study like this. So here’s your take away message: Solids are just as good as liquids when you’re riding a bike, but once you start jarring the body and sloshing the stomach, try to stick to liquids (and I would actually consider a gel just as good as liquid, although I’m not aware of any studies that investigate gels vs. liquids in runners). I’m personally a liquids on the downtube of the bike, liquids in a handheld flask on the run kind of guy, but I’m curious what your personal solids vs. liquids fueling strategy is. Leave your questions, comments and feedback below!